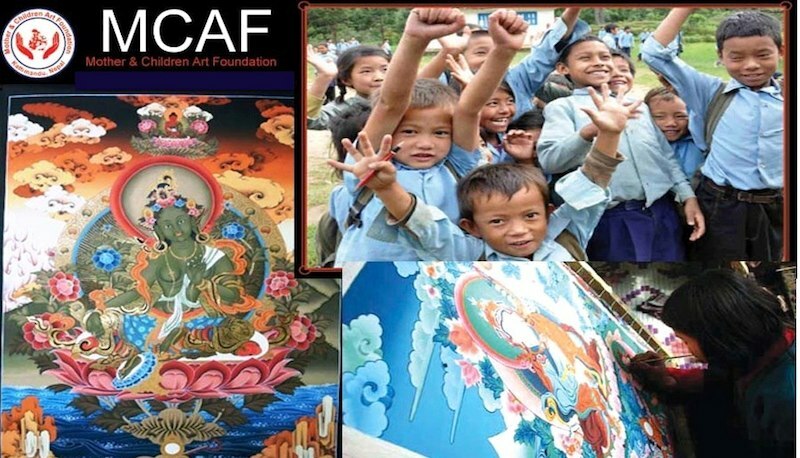 Mother and Children Art Foundation (MCAF) was established in 2004 as a non-profit organization with a dedication to the education, health and employment of impoverished women and children in Nepal. In the initial days, MCAF started with training Thangka (Traditional Art) Painting to women as a way to empower women through professional skills. Later on we have been successfully broadening our activities and services in many places with the help of our well-wishers, supporters, generous donors and partnership organizations. We have our central Art Studio and Gallery in Kathmandu and many other training centers in different part of the country. We have been conducting various social and community service projects for the benefit of schools and communities in Nepal. We have established a school called Nepalaya English Public School in a suburb of Kathmandu for disadvantaged children living under the poverty line. Women generally stay at home doing household works in the villages of Nepal and are limited in their ability to own property or participate in the decision-making of families. Women are discriminated in the society by social values and norms and yet women have not achieved equality to men. The major reasons behind this are lack of awareness, education and professional skill. Likewise there are many people living under the poverty line who cannot afford to send their children to private schools. We have very limited free government schools, and they are of very poor education standards. They are also not enough to educate all children. MCAF sees these are the major problems to raise the living standard of rural community for the development of the nation. The only way to overcome from these problems is through proper awareness, giving training of various professional skills and education to all. Empowering women through multi- skills training, providing various platforms to explore and experience the challenges to succeed in life. Providing a home and schooling facility for child labours, disables, street children and orphans, as well as to the children of lower class families and who are living under the poverty line, who would not otherwise attend school. Supporting to raise the standard of government community schools by adding infrastructures, resources and trainings.